The plaque is approximately 8″ in diameter (it’s not exactly round). What are we looking at? — That’s a very good question. In fact, it’s a mystery. This is a unique creation. Other than this one, I’ve found zero examples in person or on the internet. If memory serves me right, I came across this object at a thrift store about twenty years ago. I immediately knew it was something different. I bought it. There was no way on Earth it was going to escape me. But you see, it needed rescuing. By someone who would care about it — someone like me. I collect pueblo pottery. 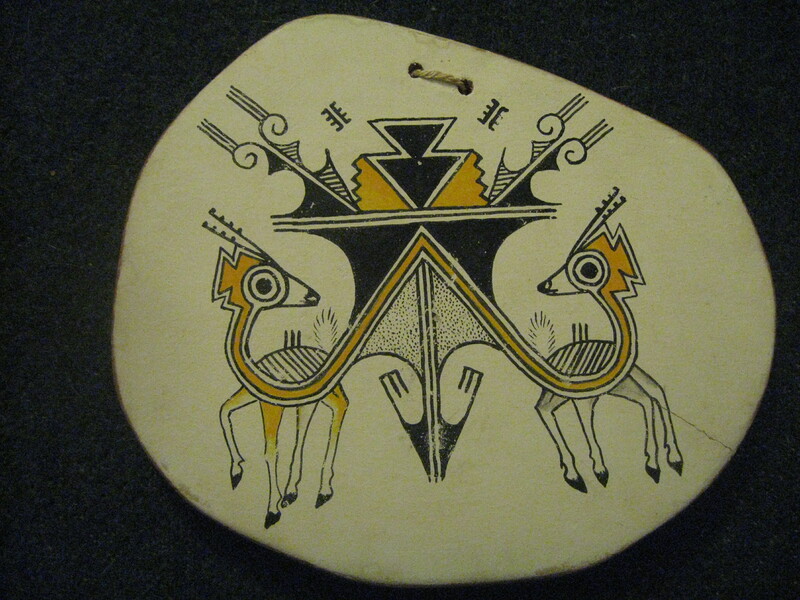 I always assumed this was a pueblo pottery piece, made from clay, and decorated or painted in the way pueblo pots are usually done; however, the artist had made it in the form of a plaque, intended to serve as a wall hanging. That alone would make it different. I didn’t start blogging until late 2014. I hadn’t been writing about my various collections, so I didn’t closely examine them; I didn’t do a lot of research on them. I just looked at them, and enjoyed them for their handcrafted beauty. When I started blogging about my collections, including my pottery, it became important for me to know more about the subject matter, since I was going to share it with the world. While conducting research for Part 3 of my series, “Native American Pottery From My Collection”, I turned to the internet. I wanted to present as much information about each piece of my pottery as possible. Well, when it came to this plaque, I found no photos or articles at all. — Nothing similar. 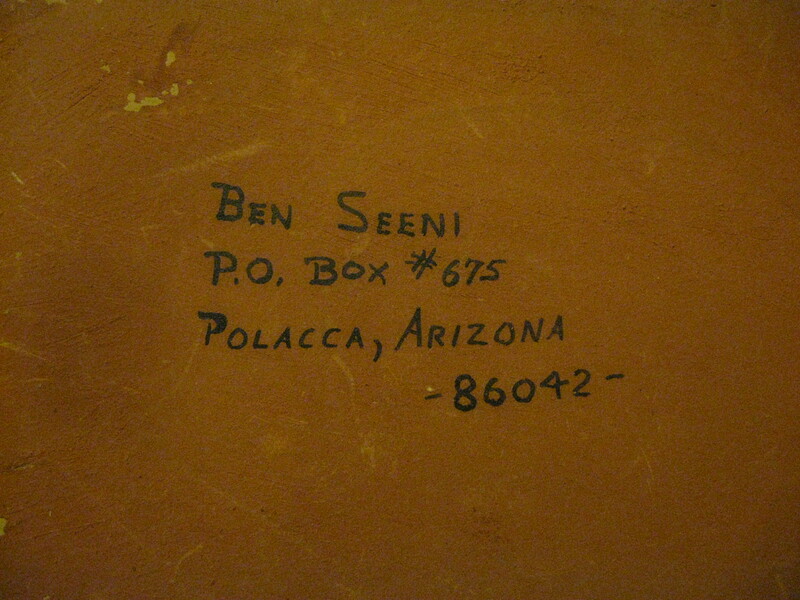 And I found only two mentions of the artist, whose name was Benson “Ben” Seeni. And here’s the thing: he was listed as a Hopi kachina carver, rather than a potter. The plaque is approximately 3/4″ thick. I took a lot closer look at the object. I held it in my hand; felt its surface. And, I realized it was not made from clay. 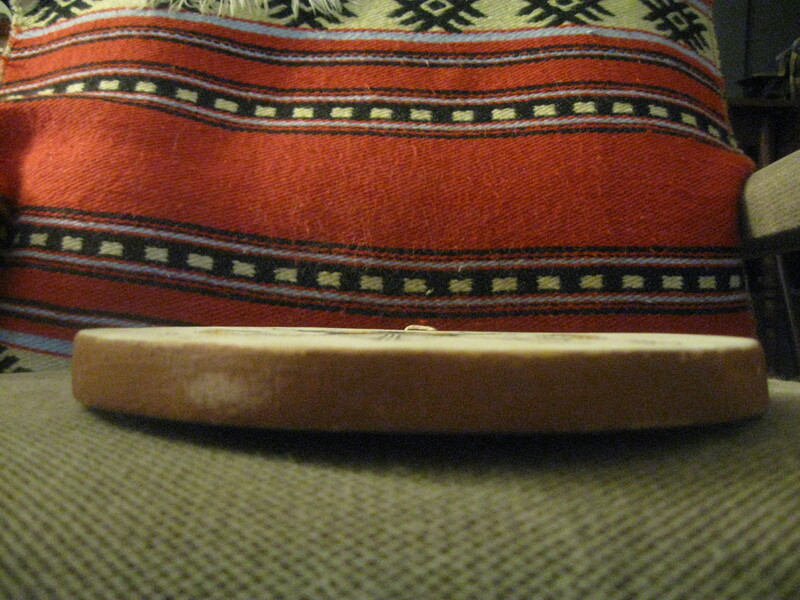 It was made from a slice of cottonwood, which is the material Hopi kachinas are carved from. I realized I truly had something different on my hands. I wrote back, giving Sharon two internet links to Benson Seeni’s information, so that the Heard could at least have something on file pertaining to him. Signature on the back of the plaque. So the plaque, and why it came to be, is a mystery. I did manage to glean a few facts about the artist. Adobe Gallery’s website states that Benson “Ben” Seeni was from Walpi on First Mesa. He lived from 1931-1999. He was an innovative artist. In addition to carving kachinas, he was the first to make katsina puppets (“jumping dolls) which have jointed limbs. — For source material, they referred to the book, “Hopi Kachinas: The Complete Guide to Collecting Kachina Dolls” by Barton Wright. I contacted Adobe Gallery one last time, asking them to help me get in touch with the author, Barton Wright. Once again, I heard from Alexander E. Anthony, Jr.; this time he wrote to say Mr. Wright passed away a number of years ago. So I’ve come to a dead end. I can find no more information about the artist, or the piece he created — the piece which fell into my possession by complete happenstance. Because I chanced to be at that thrift store, at that minute. — You know, it could have gone to anyone. But it wound up with someone who is bound and determined to find out the secret to its mystery, and to share that secret. With you! If you’ve seen plaques made by kachina carvers, please let me know. If you have any info at all regarding Mr. Seeni, please share it with me? Feel free to leave comments here, or email me @gmail, where my handle is erbowles234. Thank you! Update: Laura Addison, curator at Santa Fe’s Museum of International Folk Art shared this information with me on 6/3/16, after sharing my photos with a friend who is familiar with Hopi art: My friend noted that his first impression was that it was made by a student from the Santa Fe Indian School. The art program there from the 1930s to the 1960s advocated a particular pictorial style for Native American painting that was very linear and stylized. It’s thought that Mr. Seeni was once a student at the school. Updated update: Dang. Everything pointed to me donating the painting, which is what I call it now, to the Hopi Cultural Center. Around June 1, I left the Center a voice mail; a week later I called and got a human on the phone, who was going to have the Director call me, so I could donate the piece. I’ve never heard back…. It’s looking pretty good on my wall. And furthermore: I shared this in the below-listed Facebook group. I connected with a relative of Mr. Seeni, and one or two other folks who knew him. No one could tell me a whole lot about this. It remains a mystery.